Why You Should have a Military Entrenching Tool. This morning I want to talk about entrenching tools. They are extremely handy and everyone should have one in all their vehicles. They don’t take up much space and can be used for many different things. In my vehicles, I carry older entrenching tools not the new E tool. The older ones are a bit heavier but are a lot stronger and easier to dig with. I have several each of three different styles. The first is the older U.S. issue. They are a good sturdy tools with the longest handle of the three styles. 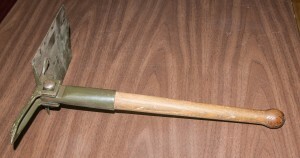 The overall length of the U.S. entrenching tool is 28 inches. 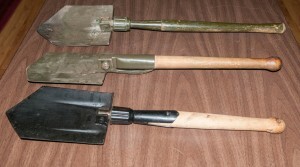 The shovel or entrenching tool, has a single fold blade so the it can be used as a hoe, pick or shovel. The second is the German Extra Heavy Duty Entrenching Tool. This has both a shovel and a pick. It locks in four positions, the shovel straight for general digging, the shovel at 90 degrees for use as a hoe, the pick can be used straight or at 90 degrees. It has a hard wood handle and measures 17.5 inches closed or 25 inches open. It is the heaviest of the three and the sturdiest. The third one I have is the East German. It is the shortest and the lightest of the three, measuring 22 inches when open. It is a folding design very similar to the older U.S. It is sturdy and well built, it is normally the cheapest of the three. These shovels have a multitude of uses. 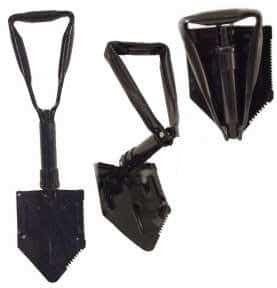 If I want one to carry in my bug out bag I am going to get the U.S. E tool which is a tri-fold entrenching tool. It is light and smaller than the three mentioned above. It is not as strong but will get the job done if you use your head and not totally depend on brute force. The one thing to remember with any of them is to avoid all the cheap reproductions that are on the market and get real military ones. This entry was posted in equipment, self defense, Seventy-two hour kits, Shelter, survival, tools and tagged e tool, entrenching tools, Howard, shovel. Bookmark the permalink. 5 Responses to Why You Should have a Military Entrenching Tool. for the BOB which is 26oz. I don’t find a need for one for the GMHB (also my hunting bag) as it would be under a 3 day deal and I can make due with the tools at hand. An E-tool is lots better than NO tool. 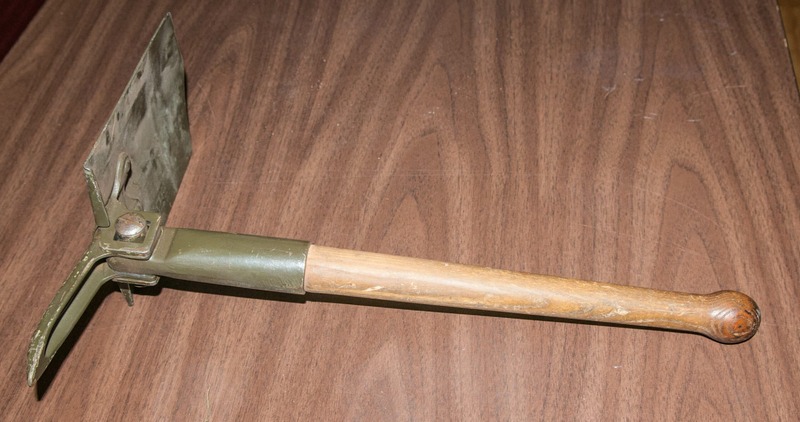 But if you really need one, a standard combat engineer’s shovel, pry bar, pick, axe and bow saw, packed in a Bailey’s bag, as stashed in US military vehicles is the way to go. Prepared peopledon’t pack toy tools! The most important disaster prep tool is a chainsaw! Just bought an entrance into tool and now wouldn’t live without it.